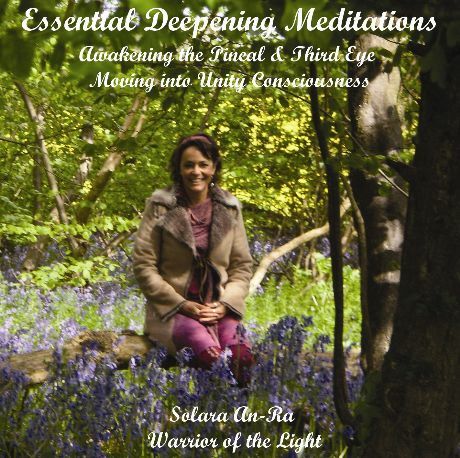 Solara's first CD, recorded for her original 4-week 'Foundation Meditation' Courses ~ for beginners. Four guided meditations designed to bring peace into your body and your life. Even beginners to meditation will find it easy to follow Solara's guidance ~ connecting with your sacred breath, with your energy centres and with Mother Earth. There are 7 magic steps in this meditation, which my guides say include everything you need to be grounded and in your full power – and they work! Grounding is essential on a daily basis, to bring you into your body, focus you and place you into the present moment – your only point of power. Calling your energy back to yourself regularly is also crucial – combined with becoming aware of your aura/energy body. Alternate nostril breathing is an amazingly effective technique for balancing you and putting you in a meditative state. Don’t take my word for it – try it! When you have mastered the technique, try it out on your own, without the CD, settling into your own place – even a few minutes of this will calm and centre your. You can practice this anywhere – even in your tea break when you are stressed at work. In this track you are led straight into a ‘third eye meditation’ – a very powerful way to improve your intuition and psychic abilities. Focus on the sun, whether in your imagination or actually outside, and let the sun’s rays light up each chakra in turn. A wonderful way to start the day, or simply to balance and open all the chakras quickly. It is so empowering to connect consciously with our Father Sun – this meditation uses His healing energy and reconnects us with His power. There is a growing awareness of ‘higher heart chakra’, between the personal heart chakra and the throat. My guides call this the ‘sacred heart chakra’ or ‘Amun’, which means ‘the hidden one’. Awareness and activation of this chakra is crucial at this time on earth – it allows us to connect with all other sentient being with love – which is exactly what is necessary to heal the world right now. In this beautiful channelled meditation you will activate yourself, all beings and the Christ Consciousness Grid above earth through the energy of unconditional love. When you’re not in the mood to sit still, and need to reconnect with your body, try this fantastic movement meditation. Let each energy centre move your body, as it is awakened, expressing beauty and power and letting go limitations! The meditation ends quietly as you sit down and open the transpersonal chakras – the sacred heart, and the cosmic and earth star portals. CD3: Ascension ~ The Time Is Now! These meditations are like an ascension manual, designed to heal the separation consciousness of the Piscean age and align you with your Higher Self. You will ground and bond more deeply with Gaia, our Earth Mother, and connect into the heart of our Galaxy, the Great Central Sun. You will also learn, from Solara’s Sirian guides, ways of entering the 4th & 5th dimension NOW. Our ascension is imminent – THE TIME IS NOW to prepare ourselvelves! This wonderful meditation CD contains many of the powerful techniques Solara has been taught over the years. Many of these are tantric techniques which strengthen & balance the 2 primary forces within the body, the Shakti (Divine Feminine) & Shiva (Divine Masculine) energy streams. Bringing these 2 forces into balance leads us into Samadhi, the blissful state of enlightenment, also called Unity/Christ Consciousness.These are enjoyable, practical tools to help you shift into the fifth dimensional frequencies. THE TIME IS NOW! 1. New Essential Daily Practises: This is an even more powerful version of the 7-step meditation which my Pleiadian guides say include everything you need to stay grounded and in your full power! Grounding yourself, becoming aware of your energy body, cleansing your aura, calling your energy back to yourself and placing yourself in ‘vertical alignment’ – these are crucial steps that result in your staying in balance and stepping into your power! My guides say that if enough people did this meditation every day the world would shift into the required higher vibration instantly! 2. Om Nyaliman Shanti: A powerful mantra which uses a secret word, NYALIMAN, to pull Gaia’s magnetic energy up through your body to awaken your third eye, so that you can ‘see through the veils’ of illusion. 3. Advanced Alternate Nostril Breathing:Alternate nostril breathing is one of the most potent breath techniques ever gifted to us from the yogis. Using the bandhas (muscular energy locks) makes this technique even more powerful in balancing the left and right brain, opening the Third Eye and leading you into Unity Consciousness. As we inhale we bring PRANA into the body - using the Root Lock stops that energy from being drained, so that Earth energy rises and triggers a flow of Kundalini up the spine. The Chin Lock at the top of the in-breath creates the pressure needed to push the energies up into the top 2 chakras, propelling you into blissful higher states of consciousness. 4. 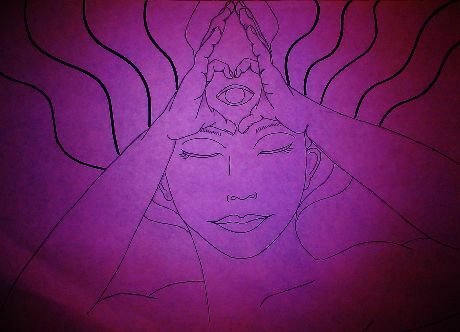 Third Eye-Pineal Awakener: This amazing meditation uses the tantric Solar (Shiva-God) & Lunar (Shakti-Goddess) forces to awaken the third eye-pineal gland. The point between the brows is the masculine portal to Ajna, while the medulla oblongata, where the neck meets the head, is the feminine entrance. The pathway between the 2 is called ‘The Psychic Bridge’, leading to the third ventricle in the exact geometric centre of the head, the ‘Cave of Brahma’ which houses the pineal gland - the true third eye. 5.Confidence-Boost Meditation: This tantric meditation awakens dormant Shakti energy and boosts all your chakras, leaving you more confident, dynamic and energised! 6. New Sacred Heart Meditation: My guides call the higher heart chakra AMUN. Awareness and activation of this chakra is crucial at this time on Earth – it allows us to connect with all other sentient beings through unconditional love, thus moving into Unity or Christ Consciousness as we were always destined to do. 7. Shiva-Shakti Dance: Start your day with this wonderful tantric dance – drawing the 2 complementary Shakti (magnetic) & Shiva (electric) energy flows through every cell of your body! Tracks 8 & 9 are for your pleasure – so that you can do any one of the mediations on your own when you are familiar with them and don’t need my guidance. I suggest that you put make a playlist on your ipod or burn your own CD with the meditations & music lined up to suit your personal preference at any stage of your personal development. E.G: You might start with the Essential Daily Practices, flowed by the music for alternate nostril breathing, followed by track 3, 4 or 5. Doing 3 practises/meditations each day will take up less than a half hour of your time – and your experience of life on Earth will improve immediately! Even if you do only 1 meditation daily you will notice the difference – peace, balance and happiness come easily from these powerful techniques. Enjoy!